According to the International Rescue Committee there are nearly 42 million displaced people in the world and of the world’s 12 million or so refugees about 3.2 million are in Africa. These definitions and statistics include displaced persons of the Sudan, who are currently dispersed throughout Sudan, Kenya, Ethiopia, Uganda, Chad, Egypt and Israel. 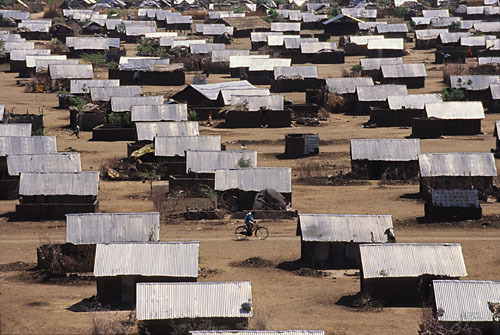 It is estimated that as many as 66,000 refugees are currently living in Kakuma, a refugee camp located in the northwestern region of Kenya. Kakuma is the Swahili word for “nowhere.” The vast majority of Kakuma residents are from southern Sudan, however there are also populations from Somalia, Ethiopia, Burundi and Uganda. Many refugees from Kakuma are youth. The social structure of Kakuma is not unlike other refugee camps, with the youth living in groups, thereby providing stability and support amongst the younger generation. These small communities have provided a sense of Sudanese traditions and culture, which may have otherwise been lost due to war, displacement and the dispersion of previous family units. Although there is some security at Kakuma, there are also numerous issues, such as malnutrition, disease and harsh weather conditions. On the other hand, the education system has been well established. Kakuma has more than 30 schools serving more than 33,000 students. Kakuma has served as a refuge for displaced persons for over twenty years and although the conditions are not dire, many hope to resettle elsewhere or return to Sudan. Since the 1980s nearly 50,000 Sudanese have emigrated to the United States. Sudanese refugees have been resettled in the United States, including in California, Georgia, Maryland, Maine, New York, Ohio, South Dakota and Texas. Most of the refugees resettled in the United States are Dinka, Nuer and people of the Nuba Mountains or Udok. Those brought to the United States are often initially supported through faith and religious communities for the first several months. The transition to life in the United States is not an easy one and various obstacles, including cultural differences, can make assimilation arduous. The current situation of the Sudanese refugees has been present in the media due to the recent elections and political developments in Sudan. Many Sudanese refugees in the United States voted and others hope to return home after the conflict is settled. In order to analyze the local news coverage from 2000 until today of Sudanese refugees, articles from Maine newspapers, such as The Portland Press Herald and Maine Today, were closely examined. Each article focused on the retelling of the Sudanese civil war and the stories of individual refugees who have survived and flourished in the United States. All stories were positive and highlighted the achievements of refugees while underscoring their stories with the lengths they had to overcome by escaping the horrors of Sudan. National Public Radio, The Boston Globe and Refugee Resettlement Watch, a blog that comments on the negative impacts of refugees, focused on the individual lives of refugees while presenting stories about their struggles to resettle and assimilate. Local media note an increasing amount of violence directed towards the Sudanese refugees, often due to misunderstandings and aggressions held against new African refugees. As the scope of readership broadened the news shifted to more factual and negative interpretations and accounts of the Sudanese refugees in the United States. The news and media coverage by national sources continued the trend of focusing on the refugees’ difficulties of transitioning to the United States, but also turned to providing current news that presented even broader overviews of Sudan. While The Huffington Post, New York Post and USA Today each examined the communities of Sudanese refugees and retold personal accounts, other media sources, such as The Seattle Times and The Chicago Sun Times reported on the recent Sudan elections and political developments. Other news sources, such as The Philadelphia Inquirer and USA Today in a later article discussed the bombing of refugee camps in Sudan. The international news reported on many of the same stories, such as elections and bombings, that national media in the United States also covered. However, sources such as Al Jazeera, Lebanon’s Daily Star, The Sudan Vision and Sudan Tribune discussed the plight of Sudanese refugees, their movement across borders, and their transition to their new lives in camps and in the new South Sudan. Many of these articles explored the “human experience” and discussed the coping mechanisms of the youth. After examining and analyzing numerous news and media sources that reported on and discussed Sudanese refugees it is clear that there are some overarching trends and recurring themes. Some examples include the focus on the story of the individual, which is highly prized in these articles because it establishes a personal connection between the reader and refugee. The articles emphasize the hardships and journey undertaken and experienced by the displaced persons, which sets a tone of compassion and sympathy. The news coverage is either on current events or a reflection on an individual’s story. Bombings, elections and the involvement of governments and non-governmental organizations in refugee camps, in Sudan and in the United States are popular stories. The media coverage started to focus on the movement of refugees back to the Sudan. Many displaced persons are already returning to their former homes and communities now that South Sudan has been established. The recent bombings and fear of the resurgence of the civil war have made refugees wary, but many articles suggest plans to return to Sudan are still in motion.